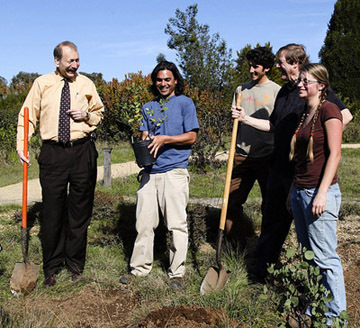 Planting rare manzanitas in the UCSC Arboretum are (left to right) Chancellor George Blumenthal, Arboretum curator Rick Flores, undergraduate Jared Marchese, manzanita expert and doctoral candidate Mike Vasey, and undergraduate Sylvie Childress. Photo by C. Lagattuta. Student intern Jared Marchese plants a San Francisco manzanita grown from a cutting taken from the last known wild plant of the species. Photo by C. Lagattuta. Chancellor George Blumenthal joined staff of the UCSC Arboretum this week to help add an important new specimen to the Arboretum's collection of California native plants. The plant is a San Francisco manzanita (Arctostaphylos franciscana) that was propagated by Arboretum staff from a cutting of the last San Francisco manzanita known to exist in the wild. "This special plant is a wonderful example of the many rare and threatened plants that the UCSC Arboretum is helping to preserve," Blumenthal said. "The Arboretum is a valuable resource for researchers and students, and the San Francisco manzanita is an outstanding addition to its rich and diverse collection. 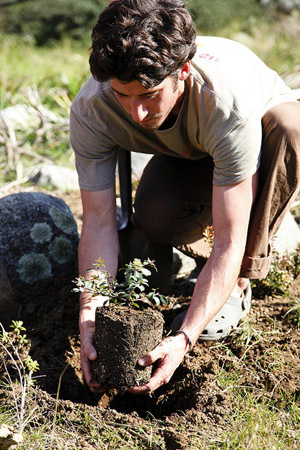 It's gratifying to play a role in the preservation of plants for future generations to enjoy." Although several botanic gardens, including the UCSC Arboretum, have had cultivated specimens of San Francisco manzanita for many years, it was thought to be extinct in the wild until 2009. That's when a botanist (UCSC alumnus Daniel Gluesenkamp, now director of habitat protection and restoration at Audubon Canyon Ranch) discovered a single plant growing in a median strip of Doyle Drive (Highway 1) in San Francisco, just south of the Golden Gate Bridge. Prior to this discovery, the last known San Francisco manzanita in the wild had been a plant growing in the Laurel Hill Cemetery that was lost to development in 1947. Unfortunately, a construction project had already been approved on Doyle Drive, and the newly discovered plant had to be moved. The UCSC Arboretum and other organizations took cuttings to try to propagate the plant. Arboretum nursery manager Helen Englesberg, working with volunteers and students, succeeded in getting many of the cuttings to root and grow. The Doyle Drive plant was moved to a secret location by Caltrans, and so far it has survived being transplanted. It is possible that the species once grew in the area to which it was transplanted, according to Stephen McCabe, research coordinator for the Arboretum. In addition to the cuttings from the Doyle Drive plant, the Arboretum also has San Francisco manzanitas grown from cuttings of plants propagated from the Laurel Hill Cemetery plant before its demise. The propagation of the Doyle Drive cuttings brings valuable genetic diversity to the Arboretum's collection, which is important for maintaining the species, McCabe said. "While we lobby for preserving plants in their native habitats as the best preservation schemes, in the cases of the rarest plants the Arboretum will propagate and preserve those that we can help," McCabe said. "It is satisfying to see the propagation crew's efforts having such success."